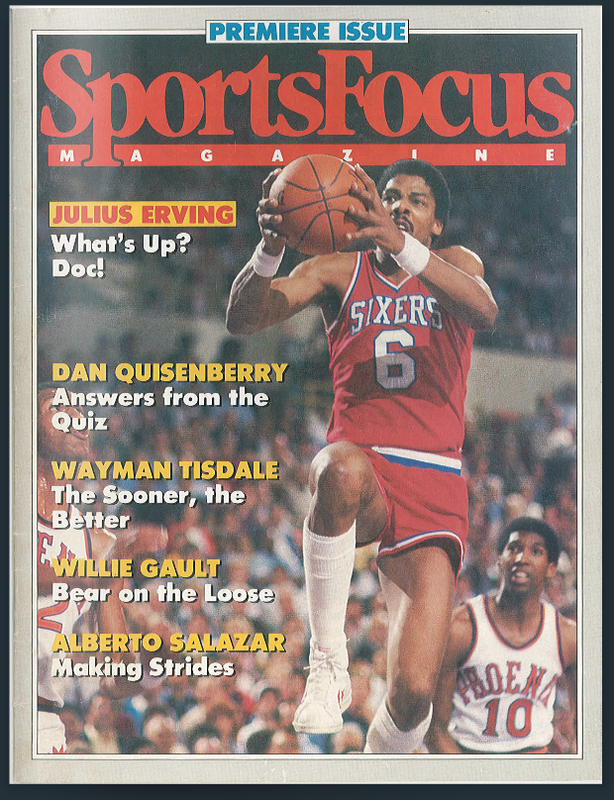 As the article states, Sports Spectrum started as SportsFocus magazine in 1985. Three of us magazine folks–myself, Sara Anderson and Steve Gier–joined some broadcast personnel, leaving Campus Crusade in July 1984 to start a ministry, New Focus. The move provided me with the answer to the question, “What is the worst decision you ever made?”, for the rest of my life, conveniently. But it also would provide a lot of good memories. INTERVIEWER: You lost your liver? INTERVIEWER: Your lover lost his liver? We also created a film series for Word Publishers, “Champions”; two of the narrators were Orel Hershiser and Cheryl Miller (then a college student). By August 1985, the TV show and the magazine had failed to catch on, and we were broke and unemployed. We went our separate ways. I eventually found employment first with Focus on the Family and then with Group magazine in Colorado. During this time, Radio Bible Class (publishers of Our Daily Bread) entered the picture, seeking a media project to reach a younger demographic. They picked up SportsFocus magazine, renamed it “Second Look” and also created a “Second Look” television show co-hosted by Kyle Rote Jr. and pastor and author John MacArthur. The Group opportunity did not work out, and I rejoined New Focus, which had re-formed as a media agency producing the project for RBC, in July 1987. The show combined segments on topics in sports with a Kyle/John studio segment that included audience questions. The magazine and television show typically covered the same topics. New Focus’s president during this time was Ralph Drollinger. You might recognize Ralph as a leader of Bible studies both at the California state capital and more recently in Washington D.C.
Back then he was our company’s president, and sadly, not a very good one. He did not work well within a client agency structure, and pretty much negotiated the television show out of existence. Seeing this, Steve Gier and I, fearing for our jobs as well, contacted our client RBC directly, pleading for help. They believed in the magazine, so they renegotiated the contract and even had us help develop a second project for them: a youth version of its popular devotional called Our Daily Bread Campus Journal, which is still published as Soul Journey. The tenure did produce another unforgettable moment–on Jan. 5, 1988, when Ralph called me from Focus on the Family headquarters, shaken and upset, to tell me that basketball legend Pete Maravich had died after a pick-up basketball game that Ralph had joined in that morning. The magazine also came back after a brief hiatus, but I soon tired of agency work (especially that experience of agency work), and I took a position at Azusa Pacific University as public information director in February 1989, ending my career in magazine publishing. That put me on the path of transitioning to college teaching, and to my position 29 years later, as a full professor journalism at Auburn University. Radio Bible Class brought the magazine project in-house about a year or two after I left (at some point renaming it Sports Spectrum), and Steve Gier moved from Southern California to Grand Rapids to continue as its art director for many years. To be honest, I eventually lost track of the magazine and its progress as a different form of publishing (that kind that avoids perishing) consumed my attention. I knew that it had been picked up by a group in Charlotte, N.C.; a former student of mine at Auburn even got a job there a couple of years without knowing my connection. But The Ringer article caught me up with its progress, and I’m glad that it’s in a solid place with Jason Romano at the helm. Pro Athletes Outreach seems a perfect organization to oversee it (though granted my last contact with PAO was more than 30 years ago). Now, as back then, the project seems guided by a belief that sports can be used in a positive way, to reinforce biblical concepts. I was particularly encouraged by Romano’s wisdom in navigating some perilous waters given race-related controversies among pro athletes today (much wiser than many evangelical leaders with a high media profile are handling political issues). I am also grateful that the article recalled 1985, when some friends and I took our idealistic faith in Christianity and the power of sports media, stumbled around a bit, and ended up affiliated in a small way with a project that does us proud, even today. Auburn folks believe in honoring the legacy of Dean of Students James Foy, if response to my blog post on the topic is any indication. Both readership and comments reflected respect and affection for the Auburn icon. With that in mind, I wanted to do more than complain (as much as that seems to be the SOP for someone my age). So here are some ideas on how the Foy Sportsmanship Trophy ceremony–and other things on campus–can reflect the man who served for 28 years as an advocate for students on campus. 1/Put ODK, not SGA, in charge. The two schools’ SGA leadership inserted themselves into the event after it was started by Omicron Delta Kappa, the senior leadership honorary that was so important to Dean Foy during his years at Auburn. Not surprisingly, this also coincided with the addition of president speeches and the singing of the fight song, and the degeneration of the event into a rude boo-fest. Glenn Richey, a faculty member in the Harbert College of Business, witnessed it firsthand when he served as ODK faculty secretary at Alabama. “I remember being on the court with Dean Foy and enduring a group of fans in Coleman Coliseum booing heavily during the trophy presentation,” he told me in an email exchange. Auburn fans responded the same way in the most recent “ceremony,” even with a Foy family member present. Returning it to ODK leadership would be the first step in restoring the ceremony’s original focus–honoring a man who graduated at Alabama, led Auburn’s student affairs office for nearly three decades and sought to keep the rivalry from, well, what it has become. 2/A film tribute to Dean Foy. Rather than speeches and a fight song, use the time for a film tribute. As with many Auburn traditions, my guess is that the students don’t know who Dean Foy is and what he stood for, and the SGA president speeches have done little to inform them. When Auburn honors a former athlete, they often do so with a brief film that incorporates highlights of the athlete’s career. Certainly a similar informative film could be produced to let viewers know about what Dean Foy means to Auburn. To avoid that happening, Richey said, the two SGAs compromised, and the “tradition” of the other SGA president leading the singing of the fight song was eliminated. So while Auburn’s SGA president handled the singing correctly, it symbolized a program that has spiraled far from its original intent. 3/Keep it simple. After the film, the ODK representatives of the school that did not win the Iron Bowl presents the Sportsmanship Trophy to the ODK chapter of the school that won, with the Foy family representative accepting it on behalf of the school. The winning school can perform its own cheer. A simple ceremony, with a touch of school spirit but centering on an individual’s legacy at rival schools. 4/Once and for all, can we name the Student Center for Dean Foy? That requires too many sub-points to explain here, but it’s always worth mentioning. The careless debacle that was Wednesday night’s Foy-ODK Sportsmanship Trophy presentation was sad on so many levels. What’s saddest is that the actions by the participants reinforced a lack of awareness of who Dean Jim Foy was and what he represented — a memory the trophy is supposed to preserve. First, let’s talk about Dean Foy. He was born into an Auburn family, but graduated from Alabama. His family moved to Tuscaloosa after his father died, and he worked three jobs to finance his education there. He and Bear Bryant were Sigma Nu pledge brothers. He became dean of men at Auburn in 1950, a title later modified to dean of students. Foy served 28 years before retiring in 1978. I was honored to serve as Plainsman editor his last year; he allowed us to break the news of his retirement. He was known for leading War Eagle cheers (particularly in a weekly competition on Fridays with the Student Union staff), but also helped guide Auburn through integration and the social upheaval of the 1960s and 1970s. But more than that, he used his background and life as a model for toning down the Auburn-Alabama rivalry and encouraging it toward sane boundaries. As so often happens, however, his legacy has been forgotten by succeeding generations of students. When the new Student Center opened in 2008, many of us alumni lobbied to have it named for Dean Foy, as the Student Union had been. The SGA Student Senate considered a resolution supporting it that year, but the resolution was voted down after the SGA president at the time spoke against it. She urged the Senate to give the University flexibility to find a naming sponsor or donor. Ten years later, it is still merely the Student Center, with Dean Foy’s commemoration limited to the information desk instead of the entire building. He deserves more. Then, on Wednesday, the trophy named after Foy suffered through yet another ceremony that ignored his legacy. 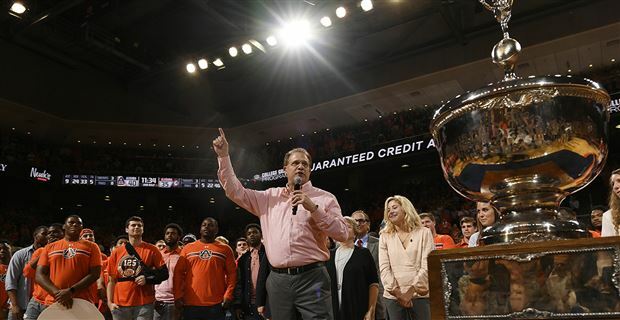 First, the Alabama SGA president made a speech that included a dig at Auburn, noting the six national championships that had been brought to the state since 2009. And Auburn fans, you’re not off the hook for booing her, either. Instead the Auburn SGA president took the mike and directed the singing to begin — one politician letting another off the hook. It is ironic that the two SGA presidents did work together, but in undermining the legacy intended by the ceremony. It’s natural for college students to enjoy the traditions of their schools, even as they rush past the individuals who laid the foundation. I have no doubt that my generation was guilty of this as well. We should do better, however, and honor these traditions in a way that shows our gratitude. Many wonder if the ceremony should be dumped. That would be the ultimate dishonor to Dean Foy. Why not challenge both SGA presidents to restore the ceremony’s original intent and use it to remind the fans of both schools of Dean Foy’s legacy? Some reflection and intent are needed. Otherwise, halftime of the Auburn-Alabama basketball game will be marked by a ceremony that is more Updyke than Foy, regardless of who wins the Iron Bowl. John Carvalho is a professor of journalism at Auburn. 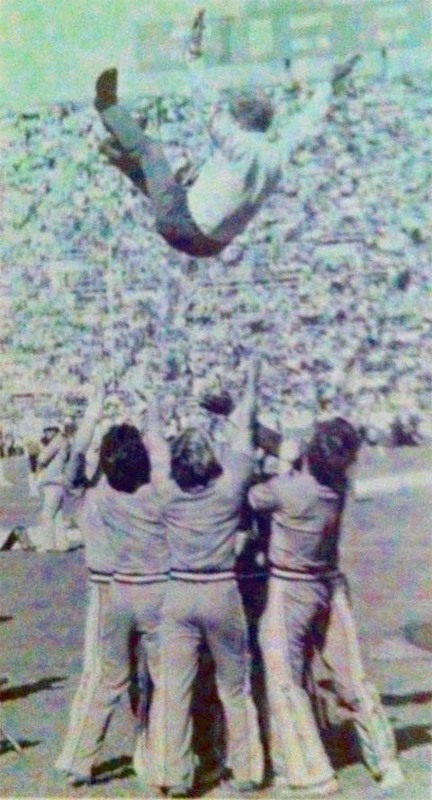 He graduated from Auburn in 1978.